Othar Turner lived in the small Mississippi community of Gravel Springs, located not too far from the nearby towns of Senatobia and Como, about an hour south of Memphis. He spent most of his life within these same few miles, working his farm and playing his music. He was born in Rankin County, Mississippi in 1908. His parents had separated prior to his birth and it wasn’t until he was nearly four years old that he met his father. Othar always held an interest in music. As a young child he played the harmonica and would beat on a 50-gallon lard can for a drum. He first heard the sound of a fife at age 16 from a neighbor named R.E. Williams and was enchanted from his very first listen. The neighbor gave Othar his first fife and the boy would practice it constantly. His mother disapproved and told him to stop, but Othar continued whenever she was away from home. When she discovered that he had kept up the fife, she broke the instrument. Othar had studied the fife so intently, he was able to remember where the finger-hole positioning was and began to make his own fifes from the cane he found near his home, using a fireplace poker to burn the holes. Othar continued creating his own homemade fifes throughout his entire life. He had also heard the sounds of the fife and drum bands played at picnics and other social gatherings and eventually created his own band, known as The Rising Star Fife and Drum Band. He performed with Sid Hemphill and later with the younger Napolian Strickland, both of whom considered Turner the patriarch of the style. Still later, Othar’s own family began to take part in his music, in particular, his daughter, Bernice, who played drums alongside her father. Fife and drum bands have their roots firmly planted in African music. Long traditions carried over by captured slaves, brought to American soil where their new owners attempted to quell the sound, especially in the South. They kept the music alive in their memories and passed them down through the generations. Various stringed and wind instruments can have their origins traced directly back to Africa. Drums in particular played a heavy part in tribal gatherings as people would use their polyrhythmic beats to communicate as well as to sing and dance along in a communal spirit. The use of fifes and drums also have military backgrounds in the United States. They were used by both American and British forces during the Revolutionary War to announce cadence and marching techniques. During this time in American history, most African-Americans were denied the right to serve in conflict carrying arms. But many were permitted to participate in these musical outfits. In fact, even Thomas Jefferson had put together a fife and drum band from his own slave holdings. In other parts of the country, full brass bands were developed as the nation grew older. At the conclusion of the Civil War, former slaves continued to perform these brands of music for a period, though the fife and drum styles began to dwindle. By the turn of the 20th century, the number of performers had decreased to the point where only a handful remained, working in limited regions of the country. You may be able to travel to Colonial Williamsburg to hear fife and drum music, but this in truth is mostly reenactments of how the music was played in the 18th century. For original, authentic fife and drum sounds, you must head to remote areas of Northern Mississippi, where the tradition has survived even to this day, creating a partial base for the development of the music now known as the Blues. Just how long that tradition will survive is in question, though. Many of the modern day performers have recently departed this world for the hereafter and younger players are in short supply. Memories of Sid Hemphill and Napolian Strickland are starting to fade. Jessie Mae Hemphill, who carried on her grandfather’s style, has been left incapacitated by a stroke and can no longer perform. And, most recently, African-rooted fife and drum music in America has taken its hardest blow, with the February 27th, 2003 passing of Othar Turner. Mississippi fife legend Turner was joined on this outing by a loose union of players billed as the Afrosippi All Stars. 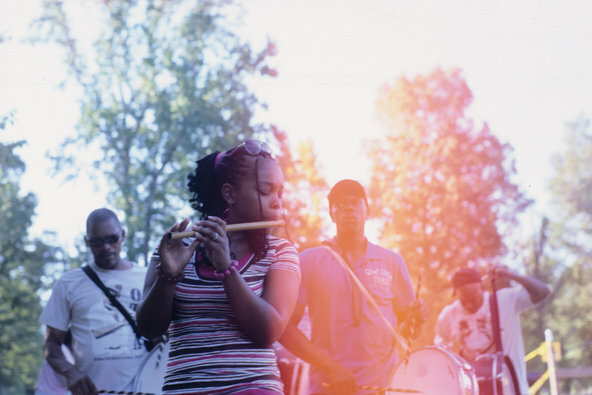 This makeshift band is comprised of members of Turner’s family, visiting Senegalese musicians, a university percussion student/organizer, and slide guitarist/producer/North Mississippi All Star Luther Dickinson. Their sympathetic accompaniment on African percussion, kora, and bottleneck guitar give “Shimmy She Wobble,” “Station Blues,” and Bounce Ball — reprised from his recording debut, Everybody Hollerin’ Goat — a depth lacking on his earlier versions. Traditional African drums exchange rhythms with marching-band snares and bass drums. Staccato kora melodies complement whining slide guitar riffs. And Turner’s shrill, archaic fife floats freely over it all. The title track is the album’s most distinctly African number, and probably the only track here easy on the listener’s ears. The closing “Sunu” is five minutes of nothing but drums. This is hardly good-time music for casual blues listeners or weekend world music fans, but it’s important music all the same, bridging, as it does, great distances between continents and traditions. “You Yankees,” says my fellow concertgoer Matthew Tamke, wrapping his powerful arms around my head as though it were a football that he was about to rush into the end zone. “We’re not the Mississippi you think we are.” Tamke and I are at the annual Otha Turner Family Picnic, a legendary jam session that takes place every summer behind a tumbledown sharecropper’s shack deep in Mississippi’s hill country. The interracial crowd is a few hundred strong and drawn from nearly every stratum of local life — bikers, college kids, workingmen, toughs, gentlemen farmers. And then there are a couple dozen like me: urban cosmopolites eager to hear the deepest roots of the blues. Tamke calls himself “a redneck,” and he’s attacked me because I’m from The New York Times. “It” is fife and drum, an African take on colonial English marching songs, and one of the oldest forms of distinctly American music, played by the slaves of Jefferson’s Monticello and still played today — by one family, once a year, at this, one of the last of the traditional farm picnics celebrating the end of the growing season. I first met Tamke earlier in the day, before the sun had gone down, when the party was still getting going. He sat beside me on a hay bale, friendly-like, and struck up a conversation. He introduced me to his father, John, who sat nearby in a wheelchair, his left leg amputated above the knee due to the ravages of Agent Orange (and who has since died). After coming home from Vietnam, Tamke Sr. became a local judge. Back in those days, he told me, it was a point of family pride to “take care of the minorities,” and he reminisced about his grandfather bringing him outside, 50 or 60 years ago, to hear the drum call the field hands to the picnic. That was around the time Alan Lomax first recorded the music. In 1942, and on subsequent trips in 1959 and 1978, the eminent ethnomusicologist found what he came to regard as his greatest discovery, a veritable Jurassic Park of fife and drum in the Mississippi hills: the Young Brothers, Napolian Strickland and Sid and Jessie Mae Hemphill. Late in life Lomax wrote a book, “The Land Where the Blues Began,” which made the case that fife and drum is “an outcropping of African music in North America.” The instruments were clearly colonial, but in the syncopation of the beats, in the interplay between the band and the audience, and in the fife itself, Lomax saw and heard a sub-Saharan tradition — the dance and music of the pygmy tribes, specifically. It was an extraordinary claim. After Lomax published his book, in 1993, blues aficionados began making their way south to hear the sound for themselves. Most of the musicians Lomax found had died, and one of the last known places to hear it was at the farm owned by Othar Turner, known as “Otha,” in Gravel Springs, Miss.